'Oh yes, you had,' said Gandalf. 'You knew you were behaving wrongly and foolishly; and you told yourself so, though you did not listen. In my last post I mentioned that I had been unable to find a photo of Nora Kershaw Chadwick, and asked if anyone could help. 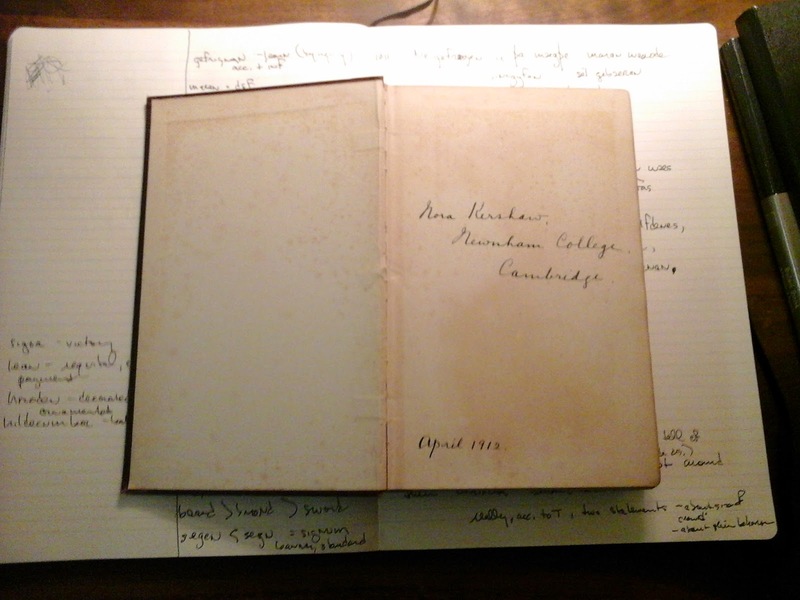 A reader, John Machin, responded, kindly sending me a copy of the Anglo-Saxon, Norse and Celtic Alumni newsletter from Cambridge University (issue 5 August 2012), which contained a photo of both Nora Kershaw Chadwick and H. Munro Chadwick. My thanks to John Machin, and to the editors of the newsletter. Recently I posted a brief review of Simon Cook's J.R.R. Tolkien's Lost English Mythology, in which he argues that Tolkien's engagement with Hector Munro Chadwick's 1907 work, The Origin of the English Nation, was essential to the formation of the legendarium we all know as Middle-Earth, and which Tolkien in part regarded as a restoration or rediscovery of a lost mythology of England. 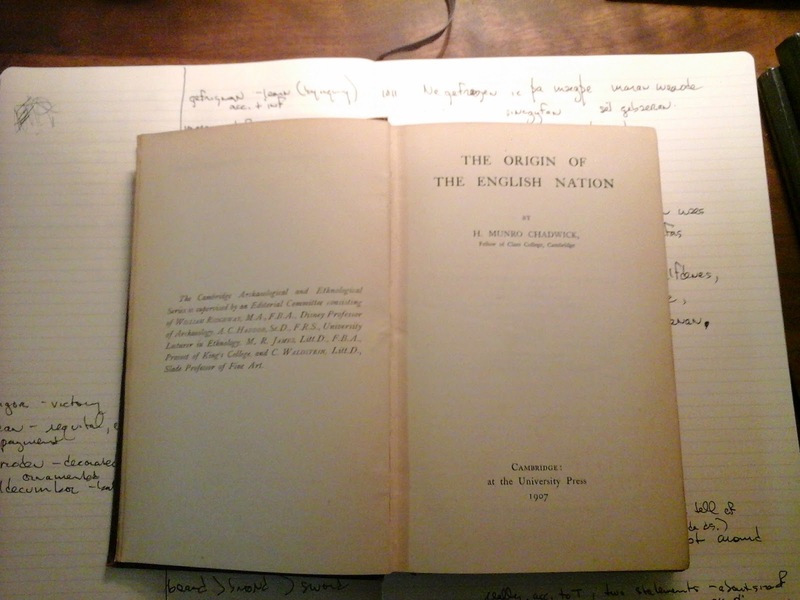 I found Simon Cook's treatment of this subject so interesting and persuasive that I decided to read not only Munro's The Origin of the English Nation, but also his later work, The Heroic Age (1912). While it was the work of only a few minutes to find e-books of both, I am still quite fond of tree-books, especially old ones. They have a heft and a texture that lends them a presence I cherish. If the paper and ink are of a high enough quality, you can even feel the letters on the page. So, despite all the advantages of e-books -- which are many and I own many -- tree-books are my first love, and you know you never get over that. For books like these, I wanted the real thing. It was when I turned to the inside of the front cover and looked at the inscription that things began to get interesting. I glanced over the end page quickly, having owned many old books with names inscribed at the front. The first detail that caught my eye was the date, April 1912. That was when the Titanic sank. A coincidence to be sure, but a mildly interesting one that makes you wonder about the person's life for a moment. Did she buy the book before or after she heard the news? Was she reading it when she heard? Did she know anyone on the ship? Did she exchange a few words with the bookseller about the disaster as he wrapped the book up for her to take home? And any mention of steamships in these years always brings to my mind another young woman of this era, my grandmother who left Ireland in 1910 for New York, returned home at some point during the First World War, intending to stay there -- her ship was stopped and boarded by a German submarine -- but was persuaded to go back to New York by an Irishman she met on the ship, my evidently rather smooth grandfather. All these moments, lost in time. How much more effectually, & with how much less mental strain, a woman can study, where all the arrangements of the house are made to suit the hours of study, – where she can have undisturbed possession of one room, – and where she can have access to any books that she may need. How very rarely, – if ever, – these advantages can be secured in any home we all know, and it is surely worth some sacrifice on the part of parents to obtain them for their daughters at the age when they are best fitted to profit by them to the utmost. Not that the process went smoothly. Though many illustrious women received an education through Newnham and colleges like it, they were for many years denied real degrees for their studies and full membership in their Universities. A failed attempt to win these privileges in 1897 led to riotous behavior that caused expensive damage in Cambridge's market square, but it wasn't the women protesting their rejection who did this. 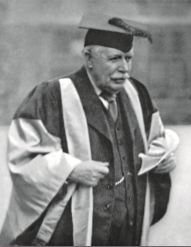 It was their male counterparts 'celebrating' it (Short History of Newnham). Women in fact received the right to vote (1918, limited; 1928, universal) before Cambridge granted them (1948) the privileges that were their due as students who had satisfactorily completed a course of studies. Enter Nora Kershaw. I saw her name in the midst of this tale, (presumably) a young student in 1912, right after what some have called The Perfect Summer, and right before the First World War came crashing down on Europe. But who was she? How does she fit into this context, this history? Perhaps the best thing about the internet (cat videos notwithstanding) is all the information it offers up with a few keystrokes. So I searched for Nora Kershaw, and the story got better. For what follows I want first of all to acknowledge my debt to Sandra Ballif Straubhaar's article on Nora Kershaw, An Extraordinary Sense of Powerful Restlessness, in Women Medievalists and the Academy (Wisconsin, 2005, ed. Jane Chance) 367-379. I remember Nora’s tussle with her mother over her clothes. Then one day she came to school in a state of great delight and excitement as she had been given a dress allowance and henceforward was to be responsible for her own clothes. That afternoon she went downtown and came back jubilant with a Chaucer, a Spenser and I don’t know how many other books that she had bought with her dress allowance--no clothes of course. The second made me first realize precisely why she purchased the book I had in my hands, and then made me sit up in surprise. 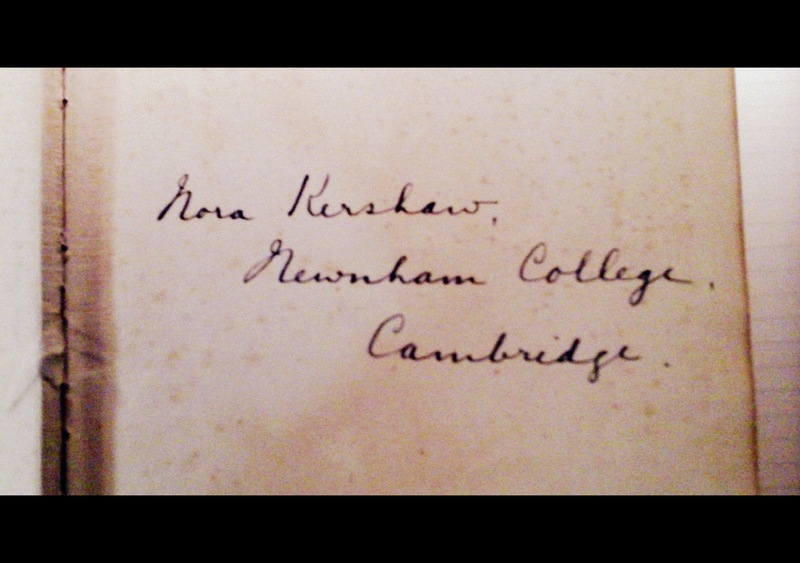 While at Newnham Nora Kershaw studied Old English with Hector Munro Chadwick (1870-1947), who was quite open-minded and advanced when it came to women at University. Ten years later in 1922, after returning to Cambridge and publishing her first book -- Stories and Ballads of the Far Past -- Nora Kershaw married him, becoming Nora Chadwick. And here I was, holding this book that had been hers, in which she had written her name. To me this is cool. Can't do this with an ebook. Thank you again, Simon Cook. 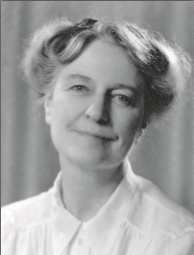 Regrettably, I have not been able to find a photograph of Nora Kershaw Chadwick to include in this post. An image comes up pretty quickly in a google search, but further investigation indicates that it is not Nora Chadwick, but another scholar by the name of Mary Boyce. If anyone could supply me with an image or a link to one, I would be grateful. 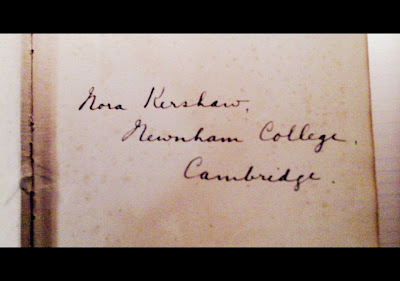 --- update 13 November 2015 -- thanks to the kindness of a reader, I now have a photo of Nora Kershaw Chadwick here. 1 For a complete bibliography of her more than 50 published works, see Straubhaar's article. My love was time’s own master, I its slave. As clear as heaven’s lights in heaven’s kindling shine. Once, once. How light his trembling hand on mine. Now all my nights are old and full of sleep? Now word comes he loves and loves in pain. Awaited him? Wait still and waiting die? licgean lifbysig, butan his lic swice. hu him scir Metod scrifan wille." Falling in the hall, dead-tired. His ghost lifting from the body-bed. His arm and shoulder -- a nice touch! Nailed near the roof by Beowulf's strength. What's going on here is wonderful. 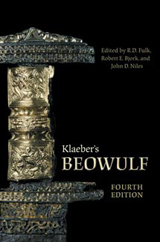 Beowulf is quick to share the credit with his men (thus "We" in 957), who did little or nothing to help him, but just as quick to blame himself (thus "I" in lines 959-65), for failing to accomplish all he had set out to do. He virtually apologizes for failing to do more than mortally wounding Grendel by tearing off his arm. But not even a hero who fights sea monsters (574-75) and can swim home from Friesland wearing thirty coats of mail (2354-68) can do what God wills not (966). This tells us two things. First, how great a hero it took to kill Grendel; and, second, how even such strength as that avails nothing against the will of God. 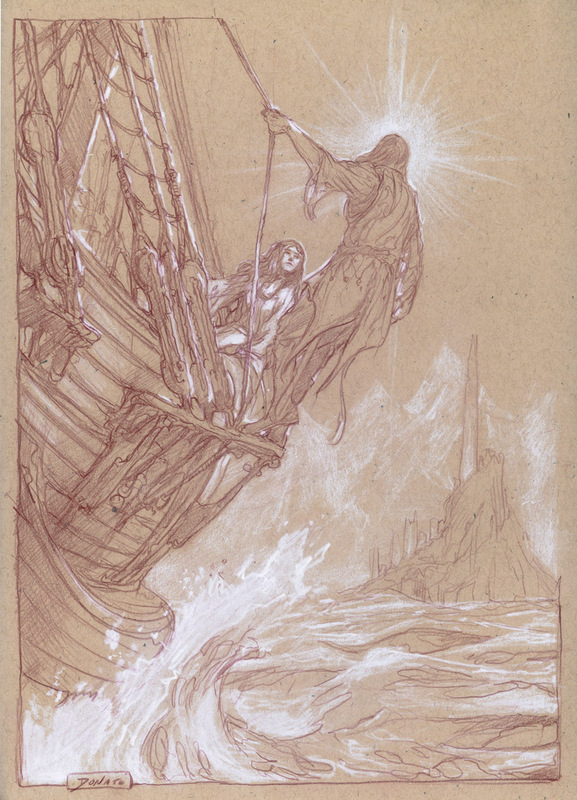 And Beowulf accepts the limits of his strength here, surrendering his enemy and God's to the judgement of God. In the very same way he had surrendered the outcome of the battle to God's will before it began (685-87). 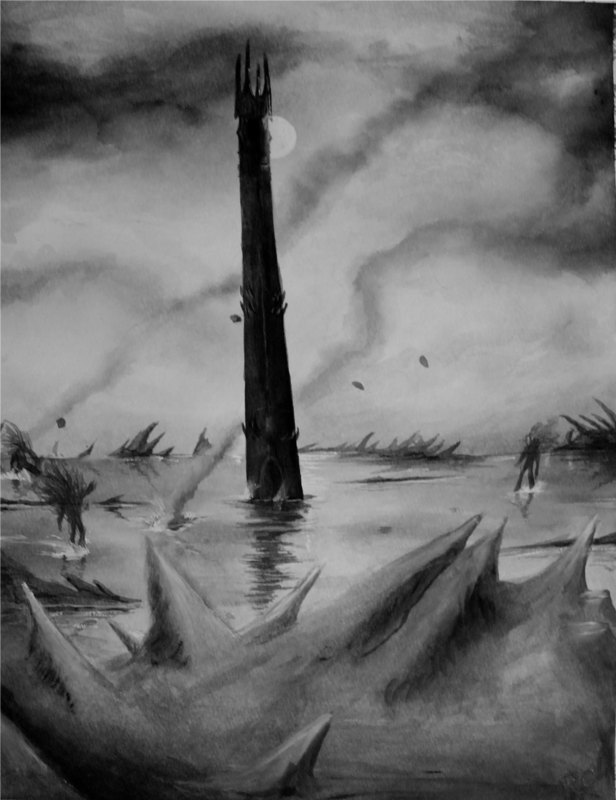 Unferth, the king's counselor, with whom Beowulf had traded barbs and boasts the night before (499-606) is now reduced to silence by Beowulf's deeds just as he had previously been by his words. And those deeds, proven by Grendel's arm, not only silence the 'old talk' about the impossibility of defeating such a monster with weapons, but seems to allow no new talk, since in fact Beowulf had defeated the feond without them, just as he had said he would (675-687). When you're down in the trenches of grammar, trying to sort out cases and syntax, parsing your way through a word or two at a time -- Why, why, why is that in the genitive plural? -- it's all too easy to overlook the way the poet has woven the story together. But when you have the fortune to notice as elegant a web as this one, it makes every moment of struggle worthwhile.